Brown Boots! | The Goose Is Out! Brown Boots! (oh look, they’ve got an exclamation mark, like us!) is Will Allen on melodeon and Martin Clarke on fiddle. Their musical background is rooted in playing music for dancing, as well as gaining inspiration from playing with their many talented musical friends at festivals and pub sessions across the country. Will Allen is a supremely talented multi-instrumentalist, although his primary focus is as a melodeon player and fiddler. He performs an extensive repertoire of folk dance tunes, mostly from the British Isles. His music takes influences from all corners of Western Europe and he has developed a unique take on traditional tunes. In 2015 he was shortlisted for the BBC Radio 2 Young Folk Award Competition. Will is also a proud member of electrifying ceilidh band Urban Folk Theory. with which he has performed at some of the UK’s biggest folk festivals. 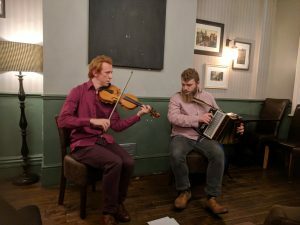 Martin Clarke is a highly-skilled fiddle player, with musical roots in the North East of England, stemming from his time studying at Durham University. He plays music from across the British Isles with influences from the continent. He also has an interest in North American music traditions. Although originally classically trained, he has a wealth of experience at playing for ceilidhs and for rapper sword dancing. He also plays for Silver Street Ceilidh Band and The Spring Heeled Jacks. All of this contributes to his unique style, producing soaring, lyrical melodies with rhythm that makes the listener want to move! Click here to go to Brown Boots! website!